Carbon dioxide is incorporated into a 5 carbon sugar, RuBP, which immediately forms two molecules of 3-PGA. This is catalysed by rubisco. 3-PGA is converted to G3P, with 1,3-biphosphoglycerate as an intermediate, requiring NADPH and ATP. Some of the G3P is used to synthesise sugars, and the rest is used to regenerate RuBP. The Calvin cycle builds carbohydrates from smaller molecules and is an energy-consuming process. ATP is used as an energy source and NADPH as a reducing agent to add high-energy electrons in order to synthesise the sugar. Carbon enters the cycle in the form of carbon dioxide and leaves in a sugar molecule. To make one molecule of sugar (G3P) the cycle completes 3 times, fixing three molecules of carbon from carbon dioxide. Carbon dioxide enters the plants through the diffusion across the stomata (specialised pores) of the leaves. It diffuses through intracellular spaces until it reaches mesophyll cells. Once in the cell, it reaches the stroma of the chloroplasts. The light-independent reactions that occur during the Calvin cycle can be organized into three phases: fixation, reduction, and regeneration. 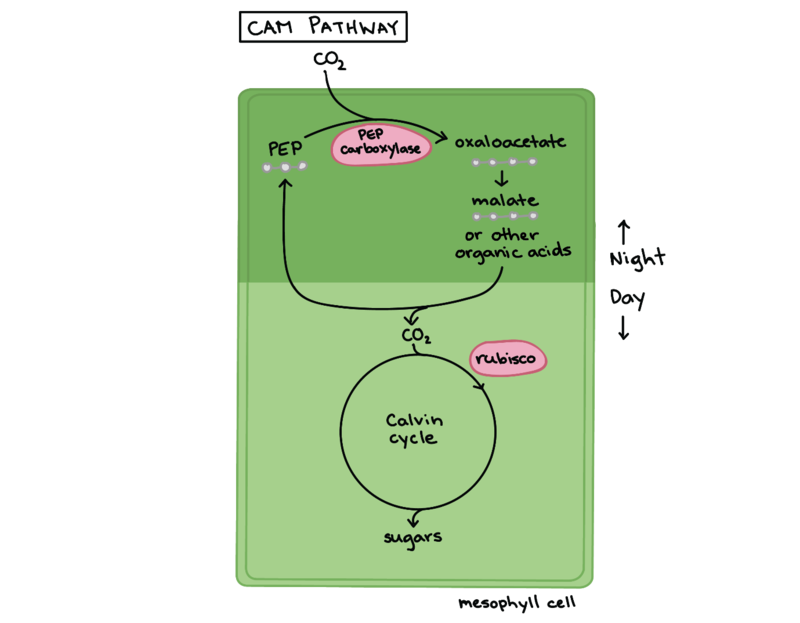 The Calvin cycle begins when a CO2 molecule is attached to a five-carbon sugar called ribulose biphosphate (RuBP). The enzyme that catalyses this process is called Ribulose biphosphate carboxylase (or rubisco). Perhaps unsurprisingly, rubisco is the most abundant protein on earth. The product of this reaction is a highly unstable 6 carbon intermediate that immediately splits into two 3 carbon sugars (3-phosphoglycerate, also called 3-PGA). For each molecule of CO2, 2 molecules of 3-PGA are produced. The number of carbon atoms remains the same. A phosphate group from ATP is incorporated into each molecule of 3-PGA, becoming 1,3-biphosphoglycerate. Following this, 1,3-biphosphoglycerate is reduced, and a phosphate is lost, becoming glyceraldehyde-3-phosphate (G3P). The electron pair required for this reduction comes from NADPH. Energy is provided for this process when ATP is converted to ADP, and when NADPH is converted to NADP+. Both of these molecules then return to light-dependent reactions to be reused. In step 3, RuBP is regenerated. This occurs through a complex sequence of reactions that rearranges 5 G3P (5x 3 carbons) molecules into 3 molecules of RuBP (3x 5 carbons). This process takes at least 3 molecules of ATP. Again, each turn on the Carbon cycle makes 2 G3Ps, so 3 carbon dioxide molecules make 6 G3Ps. Whilst 1 is exported to the cytoplasm, the remaining 5 are used to regenerate RuBP, allowing the cycle to begin again. For the net synthesis of 1 G3P molecule, the Calvin cycle requires a total of 9 molecules of ATP and 6 molecules of NADPH. Alternative mechanisms of carbon fixation have evolved to avoid the problem of dehydration in hot and dry climates. In most plants, the classical way of beginning carbon fixation is through rubisco adding carbon dioxide to RuBP. The plants that do this are called C3 plants (because the first product has 3 carbons (3-PGA). Carbon dioxide enters the Calvin cycle by entering the plant via the stomata. However, these pores are also the main site for water loss from leaves (a process termed transpiration). To reduce water loss, plant can close or partially close the stomata, but this also restricts the amount of carbon dioxide that can enter the plant to drive photosynthesis. Therefore, when stomata are closed, C3 plants produce less sugar. This drives up the concentration of oxygen in the cells, and these conditions initiate an alternative process called photorespiration. In C4 plants, the light-dependent and light-independent reactions are separated such that they occur in different cells. This ensures that Rubisco only works in an environment where there is a lot of carbon dioxide and little oxygen. 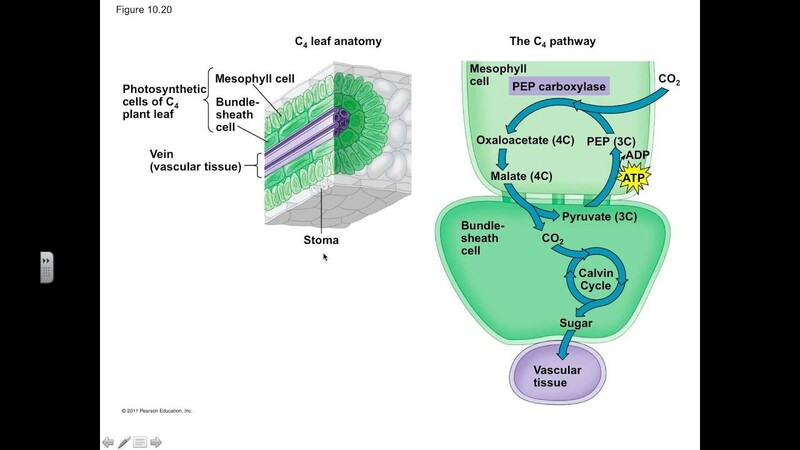 C4 photosynthesis is associated with unique leaf anatomy, with two types of photosynthetic cells: bundle-sheath cells and mesophyll cells. Bundle-sheath cells are specialised sheath cells tightly-packed around the veins of the leaf. Between these sheath cells and the surface of the leaf are the mesophyll cells. Carbon fixation only occurs in the bundle-sheath cells, but carbon dioxide is incorporated into the mesophyll cells. PEP carboxylase is an enzyme present in the mesophyll cells and adds carbon dioxide to phosphoenolpyruvate (PEP) forming a 4 carbon product oxaloacetate. PEP carboxylase can fix carbon efficiently where rubisco cannot, as it has a higher affinity for carbon dioxide and no affinity for oxygen. Once the carbon is fixed in the mesophyll cells, the 4 carbon sugar is exported to the bundle-sheath cells. In the bundle-sheath cells, the 4 carbon compounds release carbon dioxide, which is incorporated into carbohydrate material by Rubisco and the Calvin cycle. Pyruvate is also generated here and transferred to the mesophyll cells, where ATP is used to convert pyruvate to PEP, allowing the reaction cycle to continue. The ATP is generated by the bundle sheath cells, which carry out cyclic electron flow. Examples of plants that use the C4 pathway include corn and some types of grass. Succulents, including many cacti, use CAM carbon fixation. These plants behave physiologically differently from normal plants; they have their stomata open during the night and closed during the day. This helps to conserve water loss during the day but means carbon dioxide can only be taken up during the night. The mesophyll cells in these plants can store the organic products (mostly in the form of malic acid, through the carboxylation of PEP to oxaloacetate, which is then reduced to malate) made overnight until morning. Decarboxylation of malate during the day releases carbon dioxide, and when light is present the light reactions can take place. This supplies ATP and NADPH and provides energy for the Calvin cycle.